Yes, this is a sponsored review / post. All ideas, content, and opinions are ours alone. Thanks to Rogz for providing a toy to give away. Rogz is based on South Africa. The company has a relationship with KONG. 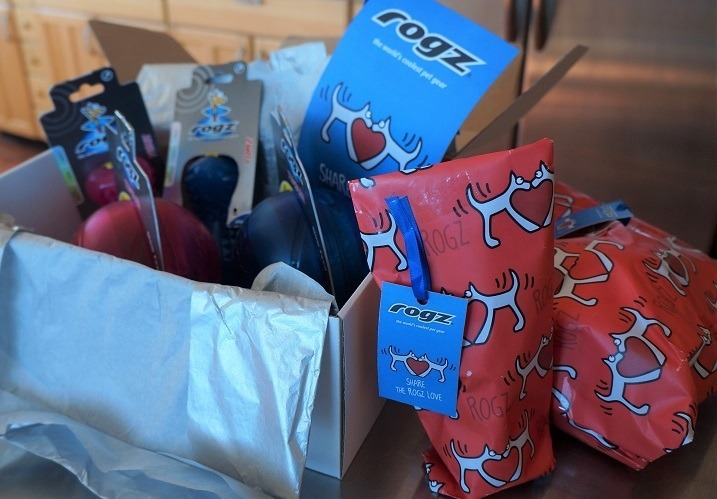 Rogz distributes KONG products there. KONG distributes Rogz products here. KONG's headquarters is in my hometown of Golden, Colorado, USA. I had the chance to tour their factory once. Check it out. For our canine heroines, Clover and Tori, who are 34 and 42 pounds, the medium size works great. Essentially, Yumz are food / treat-delivery toys with a central void that can be filled with dry or wet dog food or treats. To make things more challenging -- but not too much -- the central void features a few little "fingers" that keep the dry food and treats from simply pouring out as dogs chew upon and toss around the Yumz toy. I'm thankful that Yumz soft material is relatively quiet on our tile floors. It's a dull bonking sound that's easy for me to tune out while I write. The first time Clover and Tori played with this Yumz dog toy review, I put whole, fairly large venison treats inside. It was hard to get the treats out, and the puppy-girls played with the toys for more than an hour -- which is saying a lot for smart, active dogs. The next morning, the first thing they did was LOOK for their Yumz toys. I cannot think of a better endorsement than that. Clover figured out how to get the treats out faster than Tori did. Clover uses the crush and toss method. We joke that she likes toys she can really chomp down on because she knows she isn't supposed to pinch Tori that hard. You can tell when she is fighting the urge because she will run and get a toy she can bite when playing with Tori gets too exciting. Tori is more patient and tries to lick the treats into a softer consistency first, but she did learn to throw the toy to get treats to bounce out. Yay! One Toy to Give Away as Part of This Yumz Dog Toy Review! To enter for a chance to win a Yumz Dog Toy for your dog (mainland USA addresses only), please post a comment on this Yumz Dog Toy Review post by Midnight (mountain standard time) Sunday, November 25, 2018. Be sure to include a valid email address because we will use that to contact the winner. One entry per person, please. After the entry deadline, we'll assign a number to each comment and use a random number generator to choose a winner. We'll contact the winner by email so that the person can provide us with a valid mailing address, then we'll ship the toy off in time for holiday gift-giving. Again, here is a link to where you can buy a Yumz on Amazon. For those who celebrate, Happy (USA) Thanksgiving! Buster would love this! And it sounds like I would like it too! Thanks for your review! This sounds like a great dog toy to add novelty and fun to my pup’s day! Would love to try one of these. Our bigger dog usually destroys most toys fairly quick. 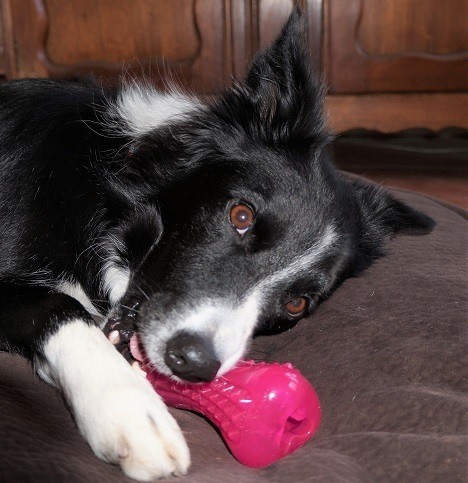 My dogs Cricket and Runner have always loved to chew on stuffed KONGS. They each get a KONG while their humans eat their own dinner. I would LOVE to purchase something new for my boys and the YUMZ would be great for them ;-). Chester loves any toy he can get food out of, he’d rather do that than eat out of his dish. 🙂 He’d have a blast with one of these toys. Looks like a great toy! We’ll throw our name in! Our crew of 7 dogs would love to test this toy! I think Rogue would love this toy! My two babies would love them. Perhaps my pups need this for Christmas!